Click the "Details Pane" command on the View menu. The Details pane defaults to the bottom-left corner of the screen. If you don't see it, try resetting the window layout using the Window menu. 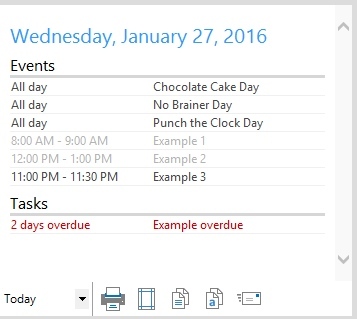 The Details Pane shows details for today or for the currently selected date, event, task, note, or contact. 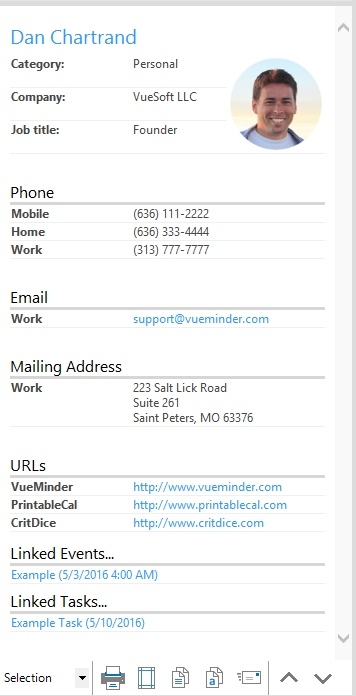 Buttons at the bottom of the Details Pane enable the details to be printed, copied, or emailed. Navigation buttons are also provided for moving sequentially through items, in the order they occur. A displayed item can be opened in the Event Editor, Task Editor, Note Editor, or Contact Editor by clicking its title in the Details Pane. The Details Pane will default to being displayed at the bottom-left corner of the main window. However, it can be repositioned anywhere on the screen by dragging the Detail Pane's title bar. A drop-down list in the bottom-left corner of the Details Pane enables displaying either the details about today's date or about the currently selected item (day, event, task, note, or contact). When an event is selected in the Calendar View or Event List, the event title, assigned calendar, category, start and end date/time, location, recurrence settings, reminder status, description, and linked items can be shown. If the event belongs to a shared calendar, the event creator and date/time of the last modification will also be shown. Any information that is not applicable to the selected event will not be displayed. Also, links (such as to web pages or local files) contained within event description will be clickable from the Details pane. 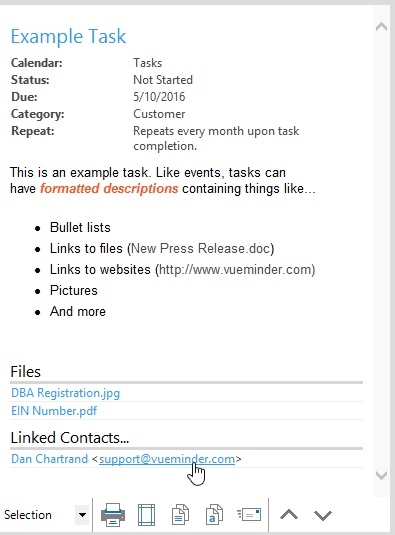 When a task is selected in the Calendar View or Task List, the task description, completion status, category, due date, start time/duration, and repeat settings will be shown. Any items that are not applicable to the selected task will not be displayed. The description text for overdue tasks will be colored red. It will be colored gray for completed tasks, and black for tasks that have not been completed but are not yet overdue. 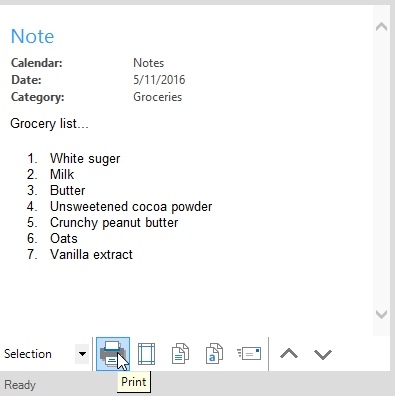 When a note is selected in the Calendar View or Note List, the note will be shown in the Details Pane. When a contact is selected in the Contacts List, the contact's details will appear in the Details Pane. When a date is selected in the Calendar View or when the Details Pane content has been set to "Today", the Details Pane will show all the events that occur on the day as well as any overdue tasks. Events that have already occurred will be colored gray. Command buttons are provided at the bottom of the Details Pane. Selection/Today - Specifies the content to be displayed in the Details Pane. It can be either "Selection" or "Today". Print - Will perform a quick print of the displayed details. A standard Print window will appear where the destination printer can be selected. Page Setup - Displays the Page Setup window where the page size, orientation, header/footer, and margins can be specified. 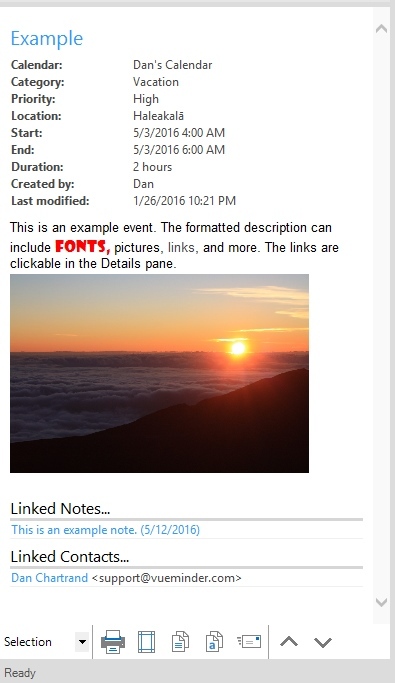 Copy - Copies the displayed details, including links, pictures, and text formatting. This can be pasted into an email, Microsoft Word, or any other program that supports text formatted as HTML. Copy Plain Text - Copies the displayed details, but strips out any additional formatting or links. Email - Initiates a new plain-text email, using the default email program (if one is installed). The email will be initialized from the detail text. Previous/Next - Enables navigation between items, based on the order they occur. When clicked, the Details Pane will be updated to show the previous or next item or date, depending on the current selection. This will also cycle through items that have been filtered in the Calendar Items list and not otherwise selectable for display in the Details Pane. These buttons are not provided when the content is set to "Today".